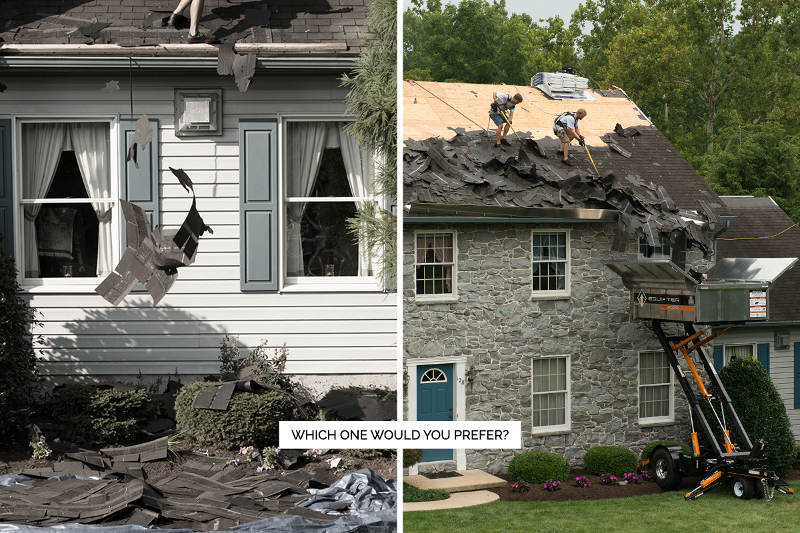 So, you're replacing your roof? We know the headaches, the stress and all the big decisions in front of you. While you're carefully examining all of your options, don't be swayed by price alone. There are some roofing companies who cut corners and offer a sub-pair end product. There is always a high cost with a cheap contractor. Make sure to look for a roofing company who's main goal is to deliver a clean, efficient job. In the world of roofing, it's unheard of to hear clean and roof replacement in the same sentence. Much less expect a clean and efficient job site. As a consumer should you be offered anything less? When you choose a company with an Equipter RB4000 you'll receive both a clean and efficient job well done. Imagine that, having your property look exactly the same way after a roofing company leaves, well, except that you have a new roof of course. The Equipter allows roofing companies to be in complete control of debris. None of your debris has to touch the lawn. From the minute those old shingles come off your roof, they're immediately in the Equipter ready to be transferred to the dumpster. It's really that simple. Instead of managing the debris 3-4 times simply by man power, the Equipter eliminates the clean up to only 1 step. Once the Equipter's container is full, you simply drive it over to the dumpster, lift, and dump. When you hire a roofing company that has an Equipter, you're ensuring the most efficient job completion on the market today. No tarps, shingles on the ground or nails to be found for weeks. No wasted time, money, or landscape.